The 2018 commercial salmon season has been a challenging one for some Alaska fisheries, and harvest information released by the state this week shows just how rough, and inconsistent, it's been. The statewide commercial salmon harvest is about 31 percent below the preseason forecast, the Alaska Department of Fish and Game said in a statement Thursday. The 2018 season, it said, "has been unusual." Preliminary numbers show a statewide commercial salmon harvest of about 103 million fish so far. That's subject to change, because the fishing season isn't completely over yet. Fish and Game's forecast in March projected a total statewide harvest of 147 million fish. "I think from a historical perspective, that's a pretty significant variance from what we'd like to see," said Garrett Evridge, an economist with Anchorage consulting firm the McDowell Group. Most of the shortfall has come in the form of poor pink salmon returns to streams and rivers flowing into the Gulf of Alaska, where the pink harvest is about half the preseason forecast amount, Fish and Game said. "We knew it wasn't going to be a good pink salmon year," said Forrest Bowers, deputy director at Fish and Game. "It's worse than we forecast." The state's sockeye harvest has been "remarkably consistent" since 2015, Bowers said. Preliminary numbers show 49.2 million sockeyes harvested so far this year, with nearly 42 million of those from the Bristol Bay area. "That leaves less than 10 million sockeye to be distributed around the rest of the state," Bowers said. Last year, Alaska's sockeye harvest was 53.5 million, and the forecast this year called for 51.6 million. For salmon overall, closures and restrictions in multiple Alaska commercial fisheries this season meant fewer opportunities to catch fish. One factor in the harvest was the unexpected run timing of several major stocks of sockeye, or red, salmon. Unusual timing in the Kenai, Copper and Kvichak rivers meant uncertainty for fishery managers and missed opportunity for fishermen, Fish and Game said. Coastal communities, especially in the Gulf of Alaska, will feel the impact from this year's poor returns, Bowers said, but it's difficult at this point to predict exactly what the economic fallout will be. "It's been a pretty tough season for a lot of people," he said. There have been bright spots. In Bristol Bay, the Togiak and Nushagak districts had their largest harvests ever, Fish and Game said. 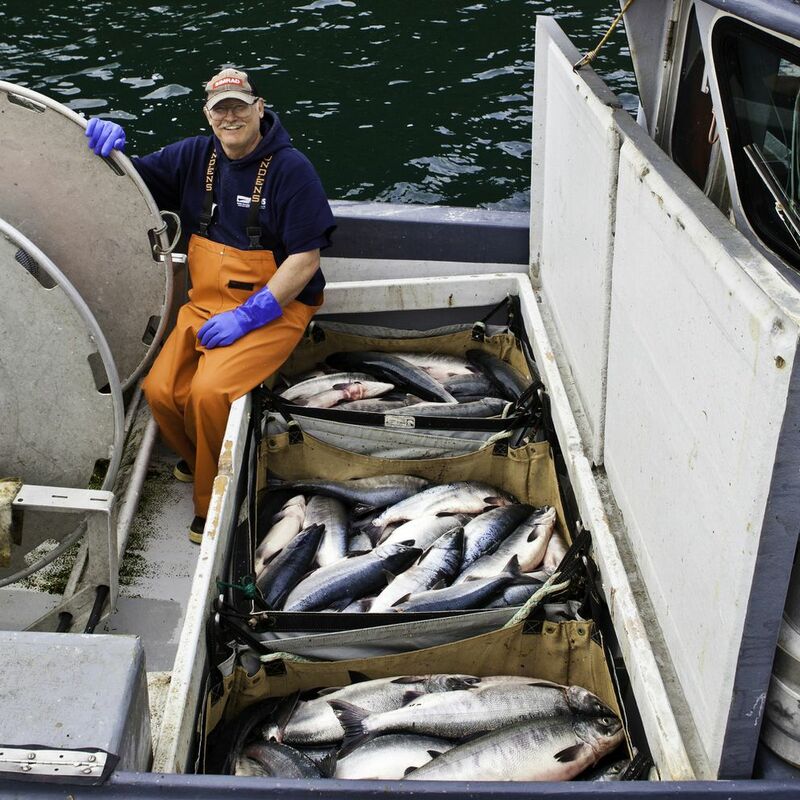 "The striking difference between Gulf of Alaska fisheries and those fisheries north of the Aleutian chain — Bristol Bay, Norton Sound — that's a pretty interesting difference there, to see that strength," Evridge said. And then there are places like the Chignik salmon fishery. The run, on the south side of the Alaska Peninsula, was so terrible that "we really haven't had a fishery there" this year, Bowers said, which is "unprecedented." On Thursday, Gov. Bill Walker declared an economic disaster for the Chignik fisheries region. "Chignik is used to catching more than a million sockeye every year. This year, they caught 128 fish," Walker said in a statement. "Salmon is the economic and subsistence staple in these communities and the failure of this year's fishery is a one-two punch." The disaster declaration means, among other things, that the Legislature can appropriate money for assistance grants. "At the statewide perspective, you see – it's kind of a mixed bag," said Evridge. "The sockeye number was pretty decent just because of Bristol Bay, but when you drill down into those figures, Kodiak struggled. Prince William Sound … the early season started off really rough." Exactly why some harvests have struggled so much is the "multi-million dollar question," Bowers said. For pink salmon, Fish and Game knew there would be reason for concern this year because the fish coming back were the offspring of those that spawned in 2016, a year when there was a federal disaster declaration for Alaska pink salmon fisheries. Bowers also mentioned the warm water "blob" in the North Pacific Ocean in recent years, creating unfavorable water temperatures for the fish that went out to sea. "Water temperature affects food availability, so we think that had a big piece to play, a big role," he said. "That's not an answer that's satisfactory to a lot of people. It's not really the smoking gun. It's not something that we have a lot of control over." Though closures and restrictions can be tough for fishermen, Fish and Game said those actions meant fish populations could meet or exceed goals for escapement — the amount of fish allowed to escape the fishery to spawn. Those escapement goals are meant to increase the chances of sustainable harvests in the future. The three largest commercial salmon harvests on record in Alaska happened between 2013 and 2017, Fish and Game said. The agency pointed out that harvests between 100 and 150 million fish are, over the last several decades, much more common than those over 200 million.